Cloud offers such as Microsoft Azure enable Enterprises to roll out huge IT solutions with one click, but it is very challenging to keep costs under control. 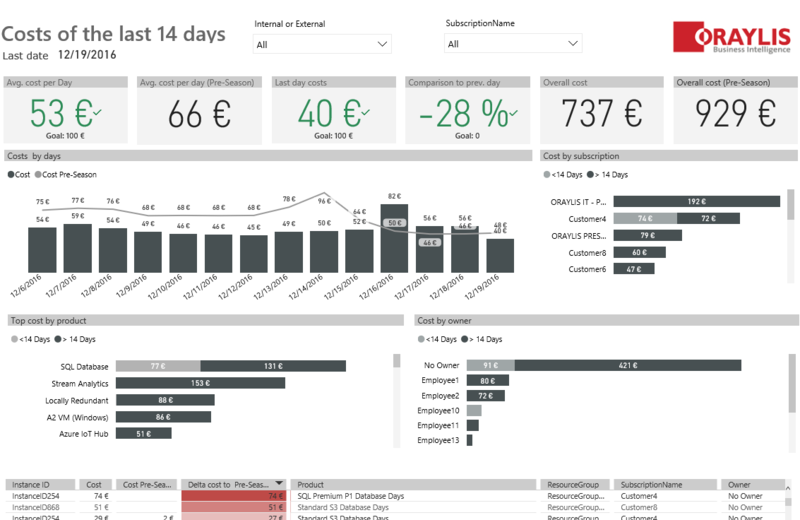 With our Power BI report you can visualize your Azure costs and consumption from Azure EA. This is a productive report which we use to follow our internal azure cost and the azure cost of our customers. 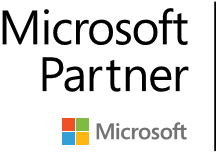 Cloud offers such as Microsoft Azure enable Enterprises to roll out huge IT solutions with one click. The disadvantage is that costs can explode from one day to another. Oraylis always faces the situation that the reporting possibilities of Azure were limited in regards of costs. 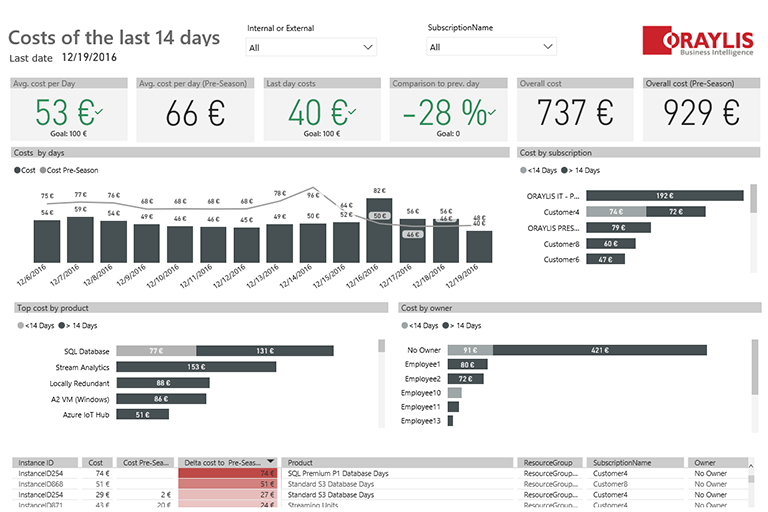 The Power BI report shown in our example allows to track Azure costs more efficient. The report contains real data, the names of our employees and customers had been removed. The data is drawn from an Azure REST API and modeled in a small multi dimensional model. 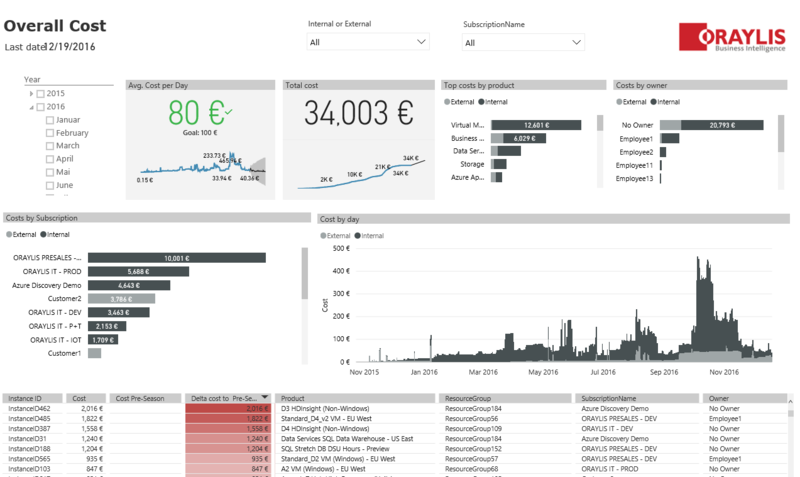 The model was extended in Power BI by additional measures for dynamic forecasting and trend calculation. The report consists of 3 pages. The first page shows the last 14 days in detail. Here you can see which new resources have been added and by whom they were created. 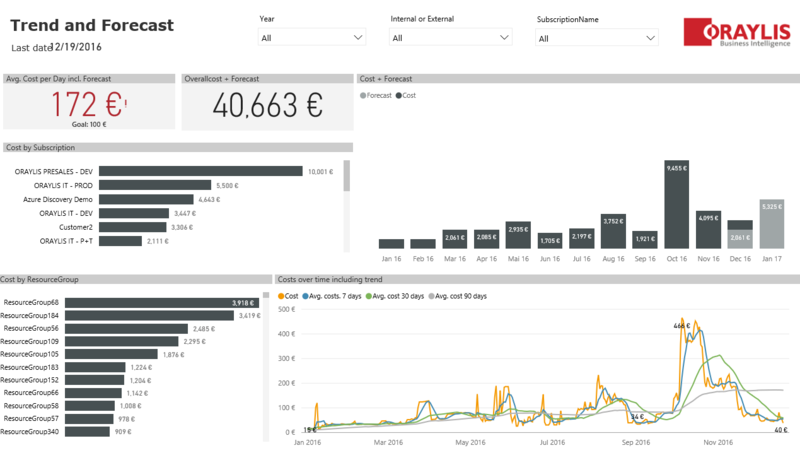 Also, KPI boxes are shown, which can be used in the Power BI portal to create an alarm, e.g. if the costs of the last day exceed 100 €. The table below shows further details. Choose a day or a subscription to see what cost the resources have created and how a resource has evolved compared to the previous period. On the page "Overall" the period can be freely selected in order to calculate the costs over a longer period of time, e.g. for each subscription. As Oraylis offers services to its customers on Azure, the report distinguishes between internal and external subscriptions. The "Trend and Forecast" page shows the current cost trends in three different trendlines: 7,30 and 90 days average. Also there is a dynamic calculated forecast, which is created with an dax measure. Try it out yourself, choose different subscriptions to see how the costs have evolved!